Notes: Immaculate condition with special 'Simon de Montfort was killed at the Battle of Evesham' rubber stamp cachet. The above Royal Mail 700th Anniv. of Parliament stamps were issued on 19 July 1965 by Royal Mail and feature the following stamp designs: 6d De Montfort's Seal; 2s 6d (non-phos. only) Parliament. 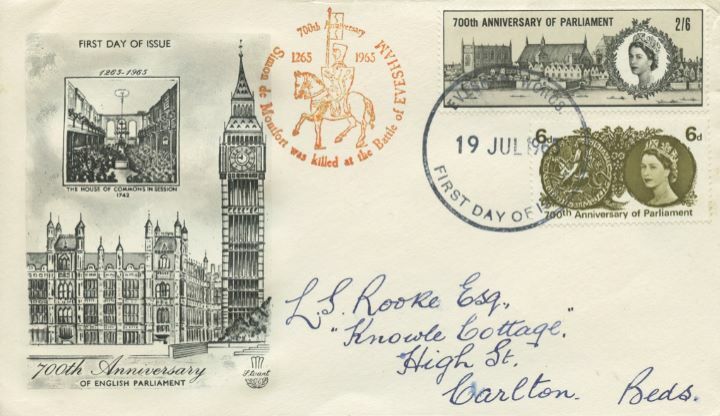 The Big Ben first day cover with the Evesham FDI Postmark postmark has been produced by Stuart and features these stamps which can make a very collectible and lovely gift.